Cobie Smulders had two films play back to back at CCFF this year, and she's great in both of them. Writer/director Kris Swanberg's third feature, Unexpected, is a very commercial movie that goes out of its way to avoid being commercial. Maybe that's not totally accurate. It doesn't try to avoid being "commercial." I think Swanberg welcomes the movie being commercial. She tries to avoid her movie being clichéd. That's fair to say. Smulders plays Samantha Abbott, a science teacher in a Chicago public high school that's weeks away from closing. She and her live-in boyfriend John (Anders Holm) get an unexpected (get it?) surprise in the form of a pregnancy, which throws all of Sam's plans into question. At the same time, she grows closer with a bright student named Jasmine (newcomer Gail Bean) who has also gotten pregnant. As the pair navigate their pregnancies together, Sam tries to help Jasmine plan for the future...and hopefully figure out her own in the process. There are so many bad pregnancy movies out there -- everything from Nine Months to the more recent and unwatchable What to Expect When You're Expecting -- that it's refreshing to see one that sidesteps so many of the tropes of this particular subgenre. When Swanberg isn't sidestepping them completely (we do still get a screaming birth scene), she does her best to at least keep them grounded in the real world. That's probably because much of the movie comes from her own life experiences: she was a high school teacher in Chicago, has one son and another on the way with her husband, fellow filmmaker Joe Swanberg. The doubts and fears that Smulders' character expresses in the film feel true to life; they're not hyper panicky "movie" problems, but the concerns of a real person who is trying to be honest with herself about what she wants and willing to allow herself to be confused. These are things we hardly ever see in mainstream cinema. I also like the way Swanberg shoots Chicago. She's not overly precious about it, capturing the city accurately by not trying too hard to capture it accurately. Because of where Sam teaches and Jasmine comes from, there are a number of scenes that take place in what would best be described as the "inner city" -- some of Chicago's rougher neighborhoods -- but Swanberg doesn't approach it as anything scary or dangerous. She shows families and communities living a normal, happy life despite some difficult circumstances. One of Unexpected's best scenes is of a baby shower crowded with extended family and friends, celebrating success with food and love. The scene doesn't exist to make any kind of statement about black communities in Chicago, though; it's about paying off everything that has come before. This is why we build families. This is why our hardships are worthwhile. This is how we get through life: together. 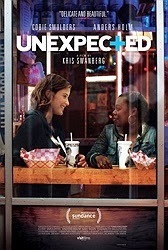 I saw Unexpected immediately after Andrew Bujalski's latest film Results at this year's Chicago Critics Film Festival, and it was fascinating to see Smulders star in both giving two very good, very different performances. Her work in Results is all about being a tightly wound Type A personality -- the kind of person who is so intense that she can actually become irritating to those around her. Sam in Unexpected is the complete opposite. She is warm and openly flawed. She is vulnerable and frightened. There are so many ways this character could have turned into a Heiglesque sitcom caricature, but Smulders -- herself a former sitcom star -- won't have it. She doesn't push for laughs (beware the comic pregnancy) nor strain for our sympathies. She simply gains them by being someone we recognize. Someone we know, someone we might be. She is human, and she is terrific. Because Swanberg and co-writer Megan Mercier are always striving for emotional authenticity in their screenplay, it can be especially jarring when characters begin behaving a way that feels convenient for the demands of the plot. It doesn't happen too often, but when it does we are quickly reminded that we are watching a movie and a commercial one at that. The performers do their best to sell those moments and succeed to the degree that the material still works even when it's a bit contrived. Mentioning the specifics would require spoilers; suffice it to say these instances are rare. The film eschews the low-fi, cinema vérité one might expect from a work that wants to be as honest and grounded as this one, instead opting for a polished (though not overly so) and well put-together movie with a real contemporary indie movie aesthetic. Yet while the formal choices are clearly cinematic, the emotions never feel faked. The thin gloss of artificiality -- its movieness -- never masks the film's big, beating heart. It's clear that with Unexpected, Kris Swanberg has made a movie that's unique to her voice and experiences, yet in its specificity has found something universal. We don't need to have had these exact experiences to recognize them as real human experiences, and that's something lacking in a majority of movies today. It gives Cobie Smulders the best role of her career thus far and proves that she has a lot more to offer than she's been able to showcase in her TV work. It has things to say about parenthood, about womanhood, about relationships, about community. It is a movie of warmth, decency and compassion. Keep an eye out for its release later this year. Looks awesome I look forward to seeing it!